Aß is formed after sequential cleavage of the amyloid precursor protein, a transmembrane glycoprotein of undetermined function. APP can be processed by a-, ß- and gamma-secretases; Aß protein is generated by successive action of the ß and gamma- secretases. 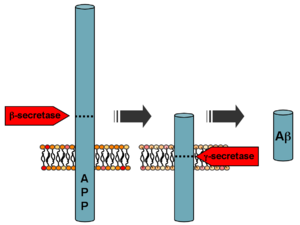 The gamma secretase, which produces the C-terminal end of the Aß peptide, cleaves within the transmembrane region of APP and can generate a number of isoforms of 39-43 amino acid residues in length. The most common isoforms are Aß40 and Aß42; the shorter form is typically produced by cleavage that occurs in the endoplasmic reticulum, while the longer form is produced by cleavage in the trans-Golgi network. The Aß40 form is the more common of the two, but Aß42 is the more fibrillogenic and is thus associated with disease states. Mutations in APP associated with early-onset Alzheimer's have been noted to increase the relative production of Aß42, and thus one suggested avenue of Alzheimer's therapy involves modulating the activity of ß and gamma- secretases to produce mainly Aß40. Autosomal-dominant mutations in APP cause hereditary early-onset Alzheimer's disease, likely as a result of altered proteolytic processing. Increases in either total Aß levels or the relative concentration of both Aß40 and Aß42 (where the former is more concentrated in cerebrovascular plaques and the latter in neuritic plaques) have been implicated in the pathogenesis of both familial and sporadic Alzheimer's disease. Due to its more hydrophobic nature, the Aß42 is the most amyloidogenic form of the peptide. However the central sequence KLVFFAE is known to form amyloid on its own, and probably forms the core of the fibril. The "amyloid hypothesis", that the plaques are responsible for the pathology of Alzheimer's disease, is accepted by the majority of researchers but is by no means conclusively established. Intra-cellular deposits of tau protein are also seen in the disease, and may also be implicated. The oligomers that form on the amyloid pathway, rather than the mature fibrils, may be the cytotoxic species. Beta -Secretase inhibitors. These work to block the first cleavage of APP outside of the cell. Gamma Secretase inhibitors (e. g. Semagacestat). These work to block the second cleavage of APP in the cell membrane and would then stop the subsequent formation of Aß and its toxic fragments. Selective Aß42 lowering agents (e. g. Tarenflurbil). These modulate gamma-secretase to reduce Aß42 production in favor of other (shorter) Aß versions. Immunotherapies. These stimulate the host immune system to recognize and attack Aß or provide antibodies that either prevent plaque deposition or enhance clearance of plaques. Anti-aggregation agents.These prevent Aß fragments from aggregating or clear aggregates once they are formed. There is some indication that supplementation of the hormone melatonin may be effective against amyloid. There are many different ways to measure Amyloid beta. One highly sensitive method is ELISA which is an immuno-sandwich assay which utilizes a pair of antibodies that recognize Amyloid beta. Imaging compounds, notable Pittsburgh Compound-B, (BTA-1, a thioflavin), can selectively bind to amyloid beta in vitro and in vivo. This technique, combined with PET imaging, has been used to image areas of plaque deposits in Alzheimer's patients. Atomic force microscopy, which can visualize nanoscale molecular surfaces, can be used to determine the aggregation state of Amyloid beta in vitro. Scmid, Randolf (June 2008). "New clue to Alzheimer's found" . Yahoo News. http://news.yahoo.com/s/ap/20080622/ap_on_sc/sci_alzheimer_s_clue. Shankar GM, Li S, Mehta TH, Garcia-Munoz A, Shepardson NE, Smith I, Brett FM, Farrell MA, Rowan MJ, Lemere CA, Regan CM, Walsh DM, Sabatini BL, Selkoe DJ (2008). "Amyloid-protein dimers isolated directly from Alzheimer's brains impair synaptic plasticity and memory". Nature Medicine 14 (June 22, 2008 online): 837. Hartmann T, Bieger SC, BrÃ¼hl B, et al. (1997). "Distinct sites of intracellular production for Alzheimer's disease AÎ²40/42 amyloid peptides". Nat. Med. 3 (9): 1016-20. Yin YI, Bassit B, Zhu L, Yang X, Wang C, Li YM (2007). "Î³-Secretase Substrate Concentration Modulates the AÎ²42/AÎ²40 Ratio: Implications for Alzheimer's disease". J. Biol. Chem. 282 (32): 23639-44. Lue LF, Kuo YM, Roher AE, et al. (1999). "Soluble amyloid beta peptide concentration as a predictor of synaptic change in Alzheimer's disease". Am. J. Pathol. 155 (3): 853-62. Kayed R, Head E, Thompson JL, et al. (2003). "Common structure of soluble amyloid oligomers implies common mechanism of pathogenesis". Science (journal) 300 (5618): 486-9. Citron M (2004). "Strategies for disease modification in Alzheimer's disease". Nat. Rev. Neurosci. 5 (9): 677-85. Lashuel HA, Hartley DM, Balakhaneh D, Aggarwal A, Teichberg S, Callaway DJE (2002). "New class of inhibitors of amyloid-beta fibril formation. Implications for the mechanism of pathogenesis in Alzheimer's disease". J Biol Chem 277 (45): 42881-42890. Michael H. Parker, Robert Chen, Kelly A. Conway, Daniel H. S. Lee; Chi Luoi, Robert E. Boyd, Samuel O. Nortey, Tina M. Ross, Malcolm K. Scott, Allen B. Reitz (2002). "Synthesis of (+)-5,8-Dihydroxy-3R-methyl-2R-(dipropylamino)-1,2,3,4-tetrahydro-naphthalene: An Inhibitor of Î²-Amyloid1-42 Aggregation". Bioorg. Med. Chem 10 (11): 3565-3569. Lahiri DK, Chen DM, Lahiri P, Bondy S, Greig NH (November 2005). "Amyloid, cholinesterase, melatonin, and metals and their roles in aging and neurodegenerative diseases". Ann. N. Y. Acad. Sci. 1056: 430-49. Wang XC, Zhang YC, Chatterjie N, Grundke-Iqbal I, Iqbal K, Wang JZ (June 2008). "Effect of melatonin and Melatonylvalpromide on beta-amyloid and neurofilaments in N2a cells". Neurochem. Res. 33 (6): 1138-44. Stine WB, Dahlgren KN, Krafft GA, LaDu MJ (March 2003). "In vitro characterization of conditions for amyloid-beta peptide oligomerization and fibrillogenesis". J. Biol. Chem. 278 (13): 11612-22.